Johnson-Brock’s Head Volleyball coach, Tera Stutheit looks up in the stands during a big home game match up for her team. To the spectators, it may just look like a coach probably taking in some special moments. Moments Stutheit takes in a lot: A great team, great coaching staff, supportive school and community, successful season; so successful in fact, her team went on to win the Class D-1 State title this year. What she is checking in the stands, however, is probably not what meets the eye this time; this time, she looks up to make sure her Broadcasting class and Striv students are taking care of business on their end as well with streaming the game. Stutheit exemplifies something special; she doesn’t ever stop teaching to coach; and doesn’t stop coaching to teach. 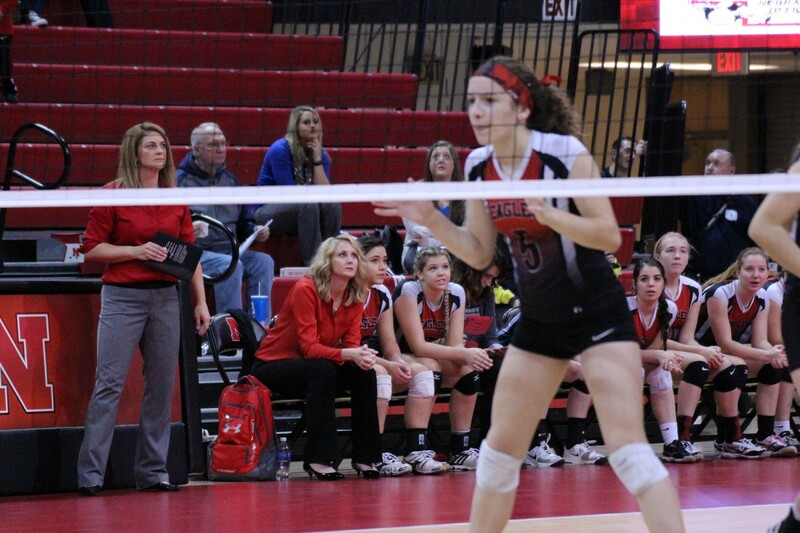 We got to talk with Tera Stutheit for our feature this week and get a glimpse of this multitasking teacher/coach who never seems to run out of ideas for the classroom or the court. This ‘aha’ moment, coupled with the few times the school had tried a free streaming service to live stream games, cause Stutheit, once again, to begin searching. The school saw the down side to the free service when they had ‘a few ads that were inappropriate for really any audience’ play during their streamed events. That’s when she discovered Striv and how much better it could be for them and what she was looking to accomplish in sharing the school’s story, for her classroom and for the students, community and beyond. Stutheit also looked into a grant from the Nemaha County Development Foundation, where ‘they don’t see these types of applications often and how it is so good for the students.’ She states that it is never too difficult to apply and receive a grant. She has also witnessed some pretty cool donations such as a ‘hot spot’ to pick up internet at the football field to live stream the games there. This donation came from US Cellular and a football parent who works there. 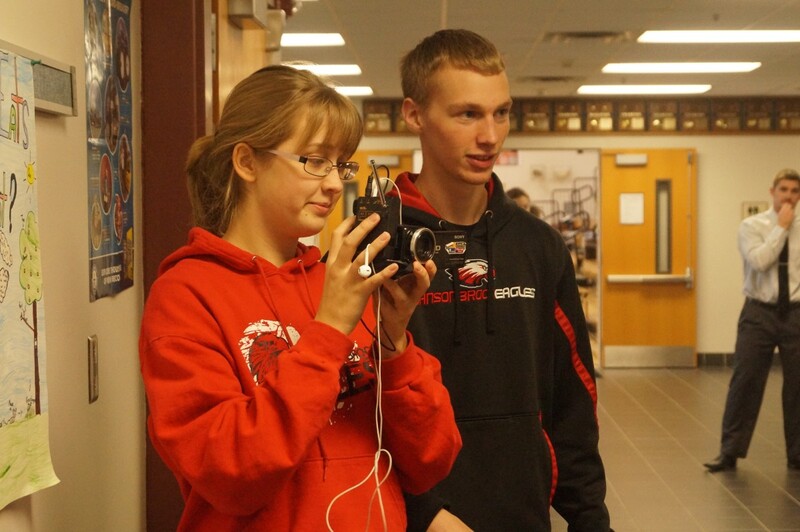 William Speckmann & Emily Oestmann behind the scenes for a video interview at Johnson-Brock High School. 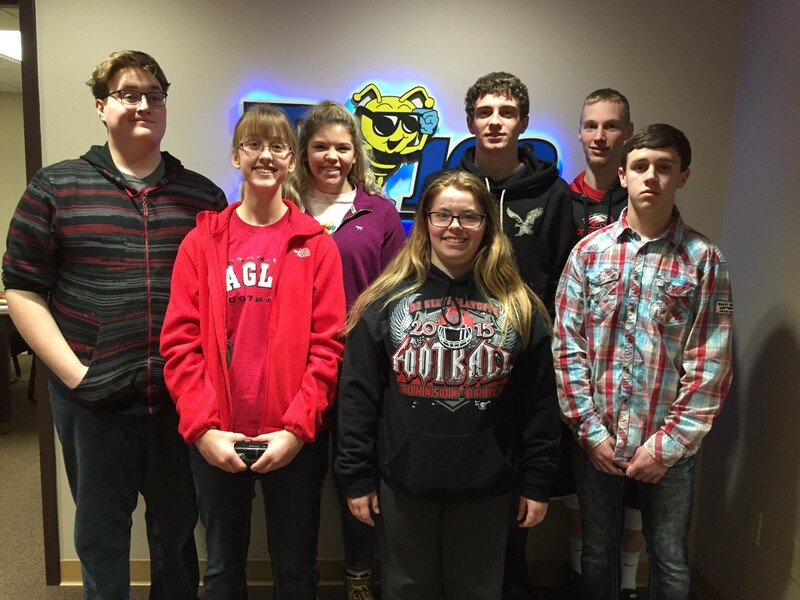 The grants have allowed Johnson-Brock and the Broadcasting class to purchase two new MacBooks, two desktop iMacs, cameras and some audio equipment which includes a soundboard, microphones and headphones. She is working to provide a great educational experience for the students while also providing for the community and beyond to help create a great environment to share the J-B Eagle’s story. They even made the decision to go ‘all-in’ and went ahead with commentating games. “It’s really hard, but from a teacher’s perspective, it is such a great thing.” Stutheit even has a son that commentates girls’ games before he has to get to the locker room, himself, to prepare for his own game that follows. Back in the classroom, Stutheit also has adapted to the students as a group and individually, understanding they all have different interests and talents. Her class is a progressive one that lets the students create. She lets them really find their niche while making sure they try every aspect of the class at least once. The students have the opportunity to find what they want to specialize in as there are a lot of different areas in broadcasting. So as Tera Stutheit sighed a breath of ease to see her Broadcasters, which does include her son, doing their job in the stands and then looks at her volleyball team, which does include her daughter, getting the job done on the court; she had to feel a sense of accomplishment in the fact that, she too, is getting the job(s) done. Helping schools share their story through live video streaming school events + online media. @StrivTVU new media education platform for students + schools.